This little item will just help to set history straight. It is the programme for the original Hungarian production of Singing' in the Rain. See the credit at the top? Harold Fielding [in association with] Maurice and Lois (we're not Jewish) Rosenfield. Oh! that they had been disassociated. Mrs Rosenfeld did nothing, during the whole process of creating the show, except scare the Fielding office staff (me, included) out of their wits with her towering concrete hairdo. Mr Rosenfeld did nothing but get the stage-rights for about half the songs from the film and then just talk. Of course, we were all glad when he brought the project to us ... but then he disappeared off to go a-perverting the law in Chicago. Great. Let the professionals get on with creating the stage production. And as far as I know he did. And we did. Tommy Steele arranged an excellent libretto (surprising, after the pig's ear he had made of Hans Andersen), Ian Bevan chased round, to excellent effect, to find songs to replace the all-important ones Mr Rosenblum had 'lost', and -- with Tommy cast, and dear Roy Castle as his suitably non-scenestealing oppo -- the boy round the office, who had shown an unexpected talent for casting, was set to find a Debbie Reynolds who could really sing, dance and act, a Jean Hagen for the 20th century, and a host of minor characters ... go for it, Kurt. And legal papers were, of course, drawn up. The first lot. Binding the Rosenkranzes in with HF for the future life of the stage show. As history tells, the London/Steele/Fielding edition of Singin' in the Rain was a very, very big and lucrative hit and made lots of money for all concerned. And we began to plan the American production, only to find we'd been forestalled. Honest Mr Rosendingle had gone ahead and had a new version written (by Comden and Green, no less) and was planning, against all agreements, to go it alone on Broadway. And just to give his erstwhile 'partners' something to think about he slapped expensive lawsuits on everyone in sight. Yes, Ian and I included. Of course, just to answer his legal papers cost tens of thousands of pounds ... getting mixed up with Chicago lawyers of even a degree of honesty doesn't come cheap. We were out of our depth. We had to give in and let him go. As history salutorialy tells, the Rosenfield/Comden and Green/New York Singin' in the Rain (feebly cast!) was a full-scale flop, had to be re-financed to keep afloat, and sank in a mess of pottage somewhere on the provincial road. And so, a new agreement was arranged. The 'American' version would have the right to be played henceforth anywhere in America. The Tommy Steele version would be licensed by Fielding in the rest of the world. Well, it started that way, but it didn't quite turn out that way. 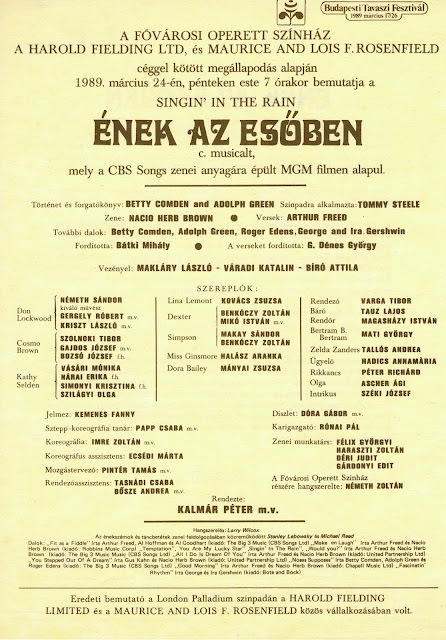 Hungary did the proper version, in 1989, as the above playbill testifies. But then? Some years later I was asked to look at an amateur production, of fair standard, in New Zealand. What had they done to the show? It was, to be polite, pretty dire. And then I realised. They were doing the 'American' version. But hang on, this was New Zealand. New Zealand, when I was a lad, was part of the 'rest of the world'. Who had 'licensed' this sad version to Christchurch am drams? Guess. Do the words 'rip off' and 'broken contract' and 'illegal' ring in your ears. They sure rang in mine. Is there something I don't know. Huh! Unlikely. Well, Harold is dead, Ian is dead, I suppose the Rosenfelds are dead, Comden and Green are dead, but I'm not dead yet and neither is Tommy Steele! If I were he, I'd have my agent or my lawyers coming down on Music Theatre International with a multi-million dollar bill. Royalties for every time the show has been played in its 'American' version outside America. Me, I can only make a noise.